Group A plant for VW Corrado 2.0, VR6 and 2.0 16V. Tail pipe 1x63mm polished. with EC number and ABE. Provider Identification. 1x middle silencer. Tailpipe S-76 mm. Muffler tailpipe S-76 mm. New group A plant for Golf 1 Cabrio and VW Scirocco 2 (53b) with silencer. 1x Silencer. Group A plant For VW Golf 3 (except Syncro). Tail pipe 1 x 60 mm bocal. 1x center tube. with EC number and ABE. Conditioning is EC number and is sold with opinion. 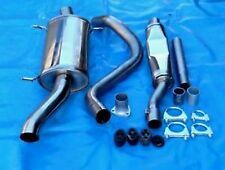 New group A plant for Golf 1 Cabrio and VW Scirocco 2 (53b) with silencer. 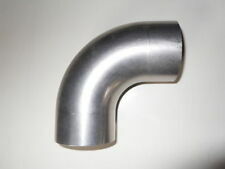 Muffler tail pipe 1 x 70 mm. Tail pipe 1x63 mm. 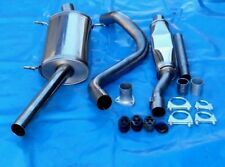 New group A plant for Golf 1 Cabrio and VW Scirocco 2 (53b) with silencer. Muffler tail pipe 1 x 63 mm. 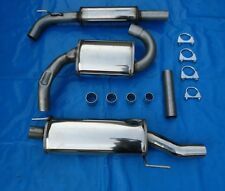 Tailpipe 77x142mm flanged stainless steel with ABE with absorber weld-on Powerendrohr. 1 x piece weld tail pipes DTM with ABE, 77 x 142 cross-section and length of 220 mm. -Weld-on tailpipe side rounded off with Central Web, crimped, chamfered with absorber of highly polished, stainless steel 4301. Tailpipe 1x 70 mm polished. 1x Silencer. 1x center tube. with EC number and ABE. - Daten sind hinterlegt! Tailpipe 1x 76 mm polished. 1x Silencer. 1x center tube. with EC number and ABE. - Daten sind hinterlegt! Tailpipe 1x 76mm S-tube. 1x Silencer. Group A plant For VW Golf 3 (except Syncro). with EC number and ABE. 1x Silencer. 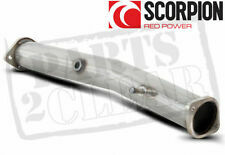 Polished tail pipe 1 x 63 mm. 1x center tube. with EC number and ABE. - Daten sind hinterlegt! Set end tubes 75x165mm flanged stainless steel with ABE with absorber weld-on Powerendrohr. 1 x set welding on tailpipes left right DTM with ABE, 75 x 165 cross-section and length 200 mm. - With ABE. Tailpipe 70x157mm flanged stainless steel with ABE with absorber weld-on Powerendrohr. 1 x piece weld tail pipes DTM with ABE, 70 x 157 section (trapezoid shape) and 220 mm length. - With ABE. Very Sportify optic and sound to. End pipe 2x70mm welding on sharp stainless steel with ABE with absorber Powerendrohr. -Weld-on exhaust tip sharply with absorber made of highly polished, stainless steel stainless steel 4301. Alarm systems. Tailpipe 2x90mm flanged stainless steel with ABE with absorber weld-on Powerendrohr. 1 x piece welded on tailpipes DTM with ABE, 2 x 90 cross section and length 220 mm. - With ABE. Very Sportify optic and sound to. Tailpipe 2x90mm flanged stainless steel with ABE with absorber weld-on Powerendrohr. 1 x piece welded on tailpipes DTM with ABE, 2 x 90 cross section and length 330 mm. - With ABE. Very Sportify optic and sound to. Tailpipe 75x165mm flanged stainless steel with ABE with absorber weld-on Powerendrohr. 1 x piece welded on tailpipes DTM with ABE, 75 x 165 cross-section and length 330 mm. -Weld-on tailpipe sloped, raised with absorber made of highly polished, stainless steel stainless steel 4301. Tailpipe 75x135mm flanged stainless steel with ABE with absorber weld-on Powerendrohr. 1 x piece welded on tailpipes DTM with ABE, 75 x 135 cross-section and length 330 mm. - With ABE. Very Sportify optic and sound to. Tailpipe 77x142mm flanged stainless steel with ABE with absorber weld-on Powerendrohr. 1 x piece weld tail pipes DTM with ABE, 77 x 142 cross-section and length of 220 mm. -Weld-on tailpipe rounded side, crimped, chamfered with absorber made of highly polished, stainless steel stainless steel 4301. Tailpipe 75x165mm flanged stainless steel with ABE with absorber weld-on Powerendrohr. 1 x piece welded on tailpipes DTM with ABE, 75 x 165 cross-section and length 330 mm. - With ABE. Very Sportify optic and sound to. Tailpipe 2x90mm welding on sharp stainless steel with ABE with absorber Powerendrohr. 1 x piece welded on tailpipes DTM with ABE, 2 x 90 cross section and length 330 mm. - With ABE. Very Sportify optic and sound to. Tailpipe 2x90mm welding on sharp stainless steel with ABE with absorber Powerendrohr. 1 x piece welded on tailpipes DTM with ABE, 2 x 90 cross section and length 200 mm. - With ABE. Very Sportify optic and sound to. Tailpipe 75x135mm flanged stainless steel with ABE with absorber weld-on Powerendrohr. 1 x piece welded on tailpipes DTM with ABE, 75 x 135 cross-section and length 200 mm. - With ABE. Very Sportify optic and sound to. Tailpipe 110x150mm flanged stainless steel with ABE with absorber weld-on Powerendrohr. 1 x piece welded on tailpipes DTM with ABE, 110 x 150 cross section and length 330 mm. - With ABE. Very Sportify optic and sound to. 1 x piece welded on tailpipes DTM with ABE, 90 cross section and length 330 mm. Weld tail pipe 90 mm sharp stainless steel with ABE with absorber Powerendrohr. 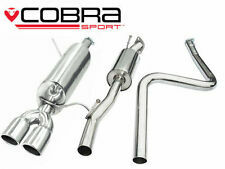 -Weld-on exhaust tip sharply with absorber made of highly polished, stainless steel stainless steel 4301. 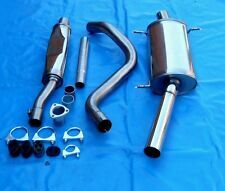 Tailpipe 77x258mm flanged stainless steel with ABE with absorber weld-on Powerendrohr. -Weld-on tail pipe tapered, chamfered side links, crimped with absorber made of highly polished, stainless steel stainless steel 4301. Tailpipe 77x258mm flanged stainless steel with ABE with absorber weld-on Powerendrohr. -Weld-on tailpipe tapered, chamfered side right, lipped ends with absorber made of highly polished, stainless steel stainless steel 4301. Tailpipe 110x150mm stainless steel with ABE with double welded on absorbers Powerendrohr. 1 x piece welded on tailpipes DTM with ABE, 110 x 150 cross section and length 330 mm. - With ABE. Very Sportify optic and sound to. Tailpipe 75x165mm flanged stainless steel with ABE with absorber weld-on Powerendrohr. 1 x piece weld-on tailpipes left DTM with ABE, 75 x 165 cross-section and length 320 mm. - With ABE. Very Sportify optic and sound to. Tailpipe 75x165mm flanged stainless steel with ABE with absorber weld-on Powerendrohr. - With ABE. Very Sportify optic and sound to. -Weld-on tail pipe with lipped ends, right side beveled with absorber, intent on 64 highly polished, stainless steel 4301. Tailpipe 75x165mm flanged stainless steel with ABE with absorber weld-on Powerendrohr. 1 x piece weld-on tailpipes left DTM with ABE, 75 x 165 cross-section and length 200 mm. - With ABE. Very Sportify optic and sound to. Tailpipe 75x165mm flanged stainless steel with ABE with absorber weld-on Powerendrohr. - With ABE. Very Sportify optic and sound to. -Weld-on tail pipe tapered, flanged, right side beveled with absorber, intent on 64 highly polished, stainless steel 4301. ARC Central tube/axle group A ( 63.5 mm) stainless steel Skoda Fabia type 6Y and VW Polo 9N 5. 15926 Luckau OT Uckro. Ronny Green & Andreas Eckstein GbR. Group A plant for VW Corrado 2.0, VR6 and 2.0 16V. Tail pipe 1 x 70 mm polished. with EC number and ABE. Group A plant for VW Corrado 2.0, VR6 and 2.0 16V. 1 x 76 mm tail pipe polished. with EC number and ABE. Ronny Grün & Andreas Eckstein GbR. - Daten sind hinterlegt!